AllMySongs Database gestiona los archivos de música y CDs de audio. All Media Grabber will help to get thousands of pictures, videos, music and sounds from programs or files on your computer. SysResources Manager monitors the current state of system resources, such as CPU, RAM, Virtual RAM availability, Computer Performance, Hard Disk Health etc. AllMySongs Database is a music library for managing and cataloging music files and AudioCD. Extract Thousands Pictures, Videos, Music, Sounds hidden inside programs and files on your computer. SysResources Manager is a system utility for monitoring the current state of important system resources. 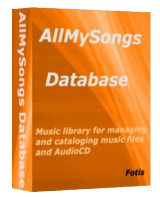 AllMySongs Database is a music library for managing and cataloging music files and Audio CD.